The story of Donelan Wines is a long and dramatic one that has been told in many a tasting room and Internet site over the past few years. To make a long story short, Joe Donelan and Pax Mahle were partners in Pax Wine Cellars, Pax was the winemaker and Joe, a 55% investor. They had a falling out that ended up getting extreme enough to become a court case, Pax went on to form Wind Gap Wines and Joe Donelan changed the name of Pax cellars to his own namesake Donelan wines. Donelan kept all the vineyard contracts that existed previously under Pax Wine Cellars. Joe and his son Tripp tapped Tyler Thomas (an up-and-coming winemaker and UC Davis grad) to be their winemaker and continued their mostly Rhone focus. Tyler took over and immediately struggled a bit to gain control of the unfamiliar beast he had inherited. The wines from all the vineyard sites were so different that it was hard for him to get a sense of the philosophy at Pax-Donelan and what it should be going forward. Pax had left Donelan with most of the winemaking knowledge in his head and Tyler was starting from ground zero. After much tasting of previous vintages and many conversations, he realized that the Donelan philosophy should be to celebrate the diversity of these special vineyard sites and to let those sites speak for themselves. On a recent trip out to Donelan I talked and tasted with Tyler Thomas about their recent vintages and set out to get a sense of what was happening there. But first, a confession: As I’ve learned more about wine, I’ve begun to develop a theory about the difference between UC Davis-educated winemakers and winemakers who advocate minimal intervention (otherwise known as “Natural” winemakers). My theory (before meeting Tyler) was that UC Davis-educated winemakers often can’t help themselves when it comes to messing with a wine. My image was one of the mad scientist behind closed doors, mixing additives with the wine to improve its taste. My image was one in which the Davis-educated winemaker simply wasn’t willing to sit back and let the wine “do its thing”. Whereas the minimal intervention, less-science oriented (in my mind) winemakers were willing to let the wine be what it’s supposed to be, to often spectacular results. Furthermore, somehow I had begun to think of this non-interventionist style of wine-making as artistic finesse. I had bought into the “natural” winemaking philosophy and therefore had created in my head this dichotomy between the art and the science of winemaking in which the two would never meet. Within the first few minutes of talking with Tyler that false dichotomy was thrown out the window. Tyler pointed to some barrels in the winery that he was most proud of. They were from a vineyard that after the grapes were crushed and they fermented, the juice was put into barrels, and he didn’t have to do anything else with it. The wine was perfect as it was. He said that his goal every year was to make wine that he didn’t have to do anything to. I was surprised by this statement and I asked Tyler if he didn’t feel that knowing so much about the science of making wine made him less likely to be able to take that hands-off approach that he espouses. Tyler, in fact thought it was the opposite. He felt that the winemaker who knows the science behind wine can actually have an advantage because he can also make decisions about when not to intervene, or make pre-emptive interventions in the vineyard before the wine has to be manipulated later. Knowledge about how to do something doesn’t necessarily mean that one has to do something. Knowledge can also help you make the decision to do nothing, which as I mentioned before, is Tyler’s ultimate goal. In other words, Tyler’s scientific knowledge sometimes allows him to stay his hand rather than over use it. He’s not a natural winemaker, yet he does believe in letting the vineyard speak for itself with the least amount of intervention possible. The Cuvee Christine: The Christine gets its name from Joe Donelan’s wife and is a blend of vineyard sites that Tyler and Joe think best epitomizes what Syrah is capable of in Sonoma County. Tyler stages about 30 to 40 blending trials to get the Syrah that he’s looking for. On the nose the wine has a floral and sweet plum component. There’s a hint of meatiness that gives the wine some classic Syrah notes and creates a sense of depth in the wine. On the palate it has bright acidity and sweet tannins layered with fruit. This is not a fruit bomb though, and that acidity carries through to a nice lift on the finish. This is a wine that doesn’t stay in your glass for long. It’s a beautifully simple and elegant wine that confirms my belief that the 2010 vintage for all its difficulties is a great one when put in the right hands. In short, it’s a beautiful expression of Syrah. During my conversation with Tyler it became abundantly clear that although Tyler is Davis educated and knows a TON about how to make wine scientifically, he still considers himself an artist. He still believes in making a wine that speaks of the vineyard from which it’s from, and not the hand of the winemaker. It’s that marriage of art and science that makes the Donelan portfolio so successful. Not all the wines are in a cool-climate Syrah style but they are made to respect the vineyard and the vintage in the best way possible. Tyler Thomas is a renaissance man, he’s combining art in science to spectacular results. One caveat for my fellow cool-climate Syrah aficionados: The 2010 and 2011 vintages were very un-characteristically cool for Sonoma County. The wines I tasted from those vintages were lighter on their feet and more food-friendly, the ‘09’s were bigger and more classically Californian in style. There’s a sense that California is gravitating back towards a lower-alcohol, more elegant style of wine. Yet, as Tyler himself mentioned, 2012, because it was warmer and drier with no late rain, will really give us a sense of whether or not that’s true. 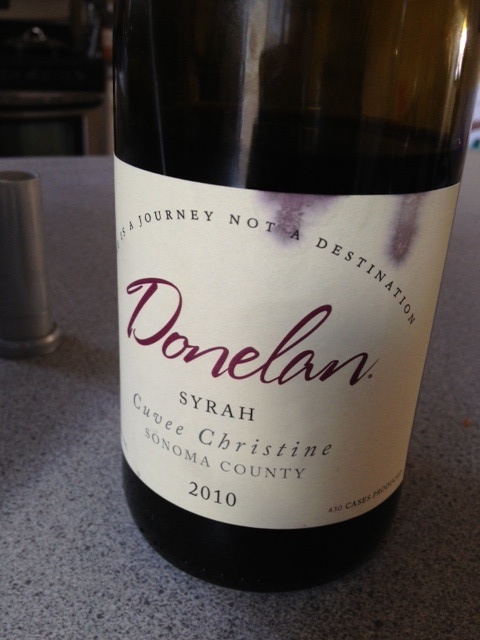 Given that the ’09’s I tasted from Donelan were bigger, blockier, and fruitier than the ’10’s, and what the ‘11’s will probably be, I look forward to seeing what direction Donelan will take in 2012. This is an area for cool climate Syrah that definitely was not on my radar until John Bonne’s article in the SF chronicle about Sonoma Coast Syrahs (this wine is formerly known as the Steel Plow Syrah). I know Sonoma Mountain well actually, having childhood friends who live up there but I didn’t have any idea that it could be a place for cool-climate Syrah. Turns out it’s a great place for Syrah. The cooler climate from the elevation gives the Syrah exactly what it needs to stay in its sweet spot and not get overly rich and extracted. And Landmark’s winemaker Greg Stach is able to keep it elegant. On the nose the wine exudes cherry and salted plum with hints of baking spices. It’s an elegant nose, hinting at how elegant and concise the wine is on the palate. This is a wine with few “flaws”. It’s expertly made, it’s smooth, delicious and has good acidity on the back end. 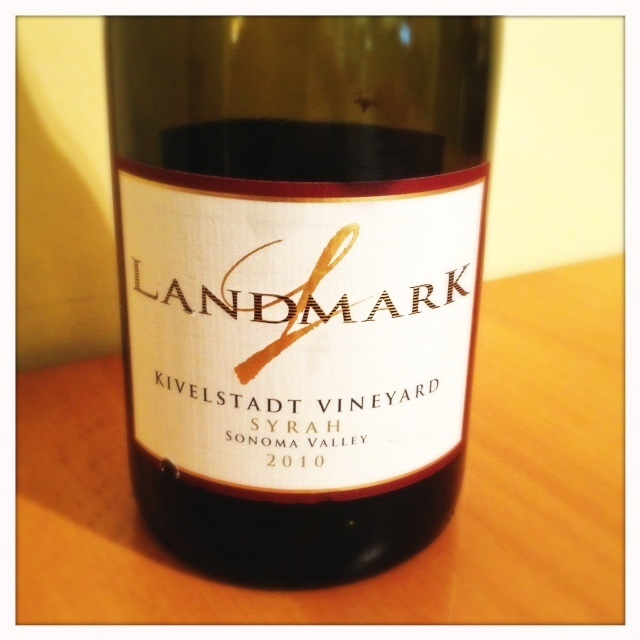 And although it’s true to Syrah as a variety, perhaps it’s a little boring. I think what I’m trying to say is that the wine lacks some of the rustic texture that I’ve come to love in cool-climate Syrah. It’s expertly made but maybe a tad too manipulated? Landmark is a winery that’s been around for a long time and they’ve grown into a big player in the wine tourism department. Although located in Kenwood, when I made a recent visit to their tasting room I felt that I might have taken a wrong turn and ended up in Napa. Don’t get me wrong — it’s a beautiful place, but as has happened with the majority of wineries in the Napa/Sonoma/Kenwood/Healdsburg area, sometimes it’s hard to find the wines through the myriad of differently colored sweaters in the gift shop. That being said, I admire Landmark’s seemingly recent Rhone focus: they also make a stellar Grenache. Despite the Rhone focus they seem to have built their reputation on Chardonnay and I have to admit the cooler-climate less-new-oak version I tasted even had me re-thinking my normal Chardonnay aversion. This is a wine that shows a lot of what I like in cool-climate Syrah, it’s varietally correct and it’s delicious. The only thing I would like to see is a little more texture in the wine to bring it up to the level of some of the other wines that I’ve tasted for this blog. To be honest, I’m not exactly sure whether that means the use of native yeasts or throwing in some whole cluster during fermentation or using less filtering but the wine needed a bit more complexity. The balance of fruit and savory was there but it simply lacked a bit of depth. I look forward to trying other Syrahs from Sonoma Mountain to see how other wineries handle this same fruit. It definitely seems like an up-and-coming area for Syrah in Northern California.